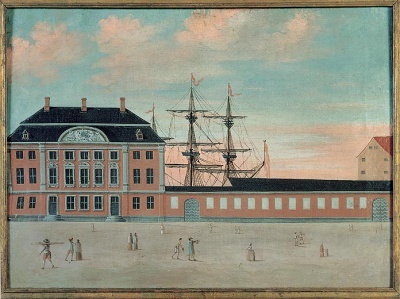 The office of the Danish Asiatic Company, the largest and most profitable company in the 18th century Oldenburg Monarchy. This wiki is a tool for researchers to store and share information about the businesses and businesspersons of the Oldenburg Monarchy in the period of early global trade from about 1600 til 1848. This wiki is maintained by Benjamin Asmussen, curator, PhD at the Maritime Museum of Denmark as a research tool. The wiki is free to use and open for contributions from other scholars. Contact me at ba@mfs.dk, if you would like to contribute. The purpose of this wiki is to gather information about persons, companies and places in order to be able to see patterns otherwise overlooked and to enjoy the benefits of sharing information. The most essential part is obviously the people of the past. When adding a page about a new person, first search for the page in the of lastname, firstname, for instance if you are looking for the merchant Michael Fabritius, search for "Fabritius, Michael". If the page exists, you can read it as well as add information or edit the page. If the page does not exist, you are given the possibility of starting it. It is recommended that you check the list of all pages (below) to make sure that the page does not already exist under a slightly different name. It is essential to add sources to all information added to the wiki, otherwise it will be worthless for others. For a book or article write (lastname, year). If the information comes from Biografisk Leksikon, add (BioLek I) (or II or III). If you use a new source, immediately add it to the page Sources & Litterature. This page was last modified on 7 August 2018, at 04:36.